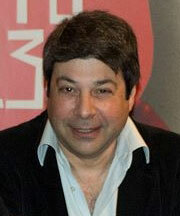 Vassilis Mazomenos (Greek: Βασίλης Μαζωμένος; born 1964, Athens) is an acclaimed producer, screenwriter and director. Founder and director of Horme Pictures and a member of both the European Film Academy and the Hellenic (Greek) Film Academy He is also known as a production designer  and a poet. Mazomenos studied political science at the University of Athens. He has worked as an author, writing for Film and Art in newspapers and art magazines. Also he has been a member of national and international juries in film festivals. He worked as the artistic director at the Kalamata Documentary International Film Festival and from 2005 to 2006 was the vice-president of the Greek Film Centre. From 2005 to 2011 he taught film at the Cinema Department of a well known Art College. From 2012 he is teaching film in Horme Pictures. Mazomenos also published in Gavriilides editions three collections of poems (2003, 2005, 2008). Mazomenos' films have been accepted for International participation at the Montreal World Film Festival (2009 and 2012), the Panorama of European Films Festival (1998, 2002, 2004, 2009, 2012), the International Film Festival of India (IFFI) in 2009, the Thessaloniki International Film Festival (1995, 1996, 1998, 2002 and 2004), the Cairo International Film Festival (2009), the Ankara International Film Festival in Turkey in 2000, the Puchon International Fantastic Film Festival in 2000, the Sitges Film Festival in Spain in 1999, the FEST (Belgrade Film Festival) (1996 and 1997) and the Fantasporto International Film Festival (1999, 2001, 2010, 2013) and at many others. Mazomenos won the Jury’s Special Award at the Panorama of European Cinema for his latest feature 10th day and won also the Special award in Cyprus International Film Festival (Cyprus) for the same film. He has been twice nominated for the Hellenic Film Academy awards (2010,2013). He has been twice awarded in London Greek Film Festival (2012, 2013) for his films Guilt (Best Screenwriting award, Best Photography) and 10th day (Best film, best direction, best photography). He was nominated for the European Fantasy Award (George Melies award) in 1999 for his film Money, A Mythology of Darkness and won the same year the jury's special award in Fantasporto for the same film. He was three times awarded in Thessaloniki International Film Festival for his films The Triumph of Time (1996), Money, A Mythology of Darkness (1998) and Remembrance (2002).